I was trying to foundation piece a rather difficult block. I asked my friend Jan for her advice and she told me it could be done but had to be made in four separate pieces and then sewn together. Well after a bit of angst (read practising more patience and detachment) I managed to make two of the said sections. Sewing them together? Hmmm… required even more patience and detachment. The result? failure… Oh well I am now thoroughly detached, enough even to put this in the scrap bag and rethink the whole project. Well, as we say around my workplace–take deep, cleansing breaths (and walk away, like my mom always said…8-). It will be better after a little break, I bet. I have faith in you. I think you would have more success doing this block with templates and hand piecing. My little group and I had a failure this week too – a Mariner’s Compass that was to finish at 8 inches and that is just too small to make those points work well enough to turn under for the applique to the background square – at least that’s my story. We gave up as we just ran out of time to go to plan B. This block can be made by machine but it will take some exact meausrements. You can hand piece it as well. I did a block similar to this from “Sylvia’s Bridal Sampler” called “Star of the Orient”. You’ve added an extra row to the block. *trying to think how it’s done and explain it* On your drawing measure the distances from where the points meet. You need those measurements to make sure those points fit that exact space. Make templates for each piece and cut your fabric. Make sure your draw 1/4 inch lines around each piece for exact piecing. You need to measure distance of one of the sides of the octagon and mark that distance on your triangles for exact placement. YOu will start with your center octagon and work out in a circle with the first row of 8 triangles going counter clockwise. Sew the first triangle but don’t sew to the end. Going conterclockwise, add the next triangle until you get back to the first triangle. Use pins to meet at each point for accuracy. Triangle 1 sits over triangle 7 to finish up. Your next row has two trianges that make one piece (A) and a square and a triangle to make piece (B). You will do the same thing. I don’t know if I’ve explained it well but I hope it’s helped. We have all been there…. Good luck! Remember, the seam ripper is your friend. Good luck with plan b.
BTW: I love your color choice! 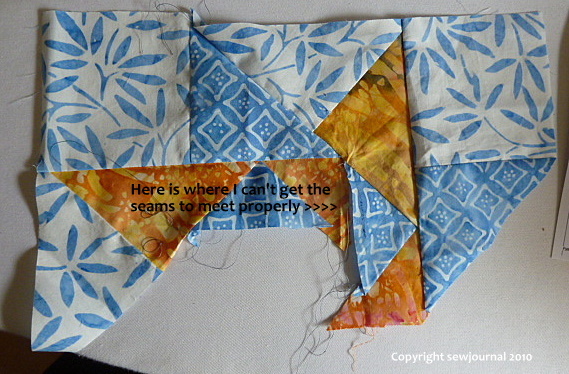 Munaiba, this block is quite straightforward to hand piece because you can easily pivot at the corners for the inset seams. Foundation piecing isn’t the way to go with this one. Though most of the liberated quilters in our group would run from doing foundation piecing, I occasionally do it because I get good results for traditional miniature blocks. But, I’ve found that I can only use the method if the block can be made all in one section-for example, snail trail block. I just can’t make a large block that is done in 2 or more sections-they never fit together. And that’s one reason we like our liberated sewing, right? (Altho I have to say that I haven’t been doing much of it lately). Thanks for sharing your experiment. 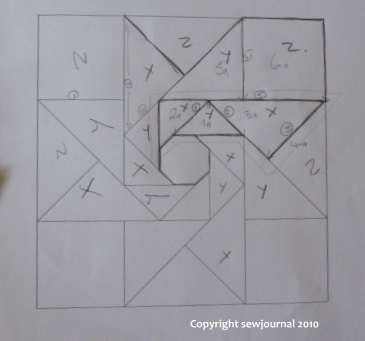 Well you know my answer to all piecing woes…..do by hand LOL. I know you will get ‘er all worked out. I admire the effort – if it was easy everyone would do it.